This conveniently located Condo has 3 king size bedrooms with full baths attached to each bedroom and 1 additional bedroom with twin bunk beds. The living room, dining room, kitchen, and 1/2 bath are located on the main floor with an outdoor patio, grill, and hot tub. 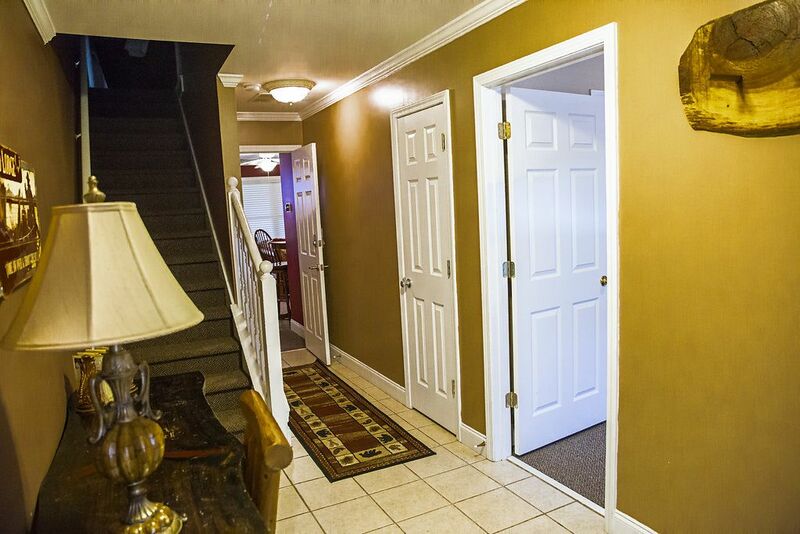 This condo is within walking distance to every attraction in Helen. It is located across the street from the park and right next to Betty's General Store. The condo is stocked with everything needed from kitchen dishes, utensils, and towels to bed linens and bath towels. Condo also contains a washer/dryer unit on the bottom floor and one on the top floor as well for your convenience. Owners are Scott & Cindy Echols also known as SC Team Holdings. We reside in North Georgia not to far from Helen. We are available to answer any questions and we truly hope you enjoy our condo as much as we do! We love the convenient downtown walk to several of our favorite restaurants. Our children and grandchildren love all the kid attractions from putt putt to tubing down the Chattahoochee. The location of this property is extremely convenient to everything. There is Betty's Grocery Store around the corner in case anything is forgotten. Full side by side refrigerator in full kitchen on 2nd floor and small refrigerator in kitchenette on 1st floor. Roomy, clean, and so convenient. Our whole family loved how easy it was to walk around town from the condo. A stress free weekend is when you can park your car and not have to get back in it until you leave. Walked right out, only feet away, to see the Christmas parade. We loved the condo and our weekend. !! Would certainly rent it again. Cindy answered questions immediately when I asked and keeps a very nice conform on top top shape. Thank you, Shirley! I’m so glad you all enjoyed Helen... We hope you come stay with us again. Excellent location! Very well appointed property! Bed was amazing! We are so glad you enjoyed your stay! Thank you and we hope you remember us when you visit Helen again. A weekend getaway for a group of friends. Always a great time and a wonderful property, in the heart of Helen, GA.
We are so glad you all enjoyed your stay. Thank you for the kind compliment and we hope you come back to stay with us soon! This was a very nice condo and a great location. We enjoyed our stay. Thank you so much and we are so glad you enjoyed your stay! Beautiful place right in the heart of Helen. Lots of room to relax and enjoy time away! Thank you, we are so glad you all enjoyed your stay!